So first of all, you’ve probably noticed I changed the design of this blog entirely. I’m kinda sad I’m not using the old layout any more I guess, since that was something I hashed together myself…but I’ve wanted to revamp my website for a while. And I’ve come to realise, any website I attempt to make now will never be as good as something that’s been properly designed by people who make WordPress themes for a living. I mean, it’s satisfying making your own things, but I have no problem letting the pros do what they do best to make something better. So, I decided to invest in an all round better layout for this site and I’m now really happy. I had an idea of the features and layout I wanted anyway, so finding one that suited my blog didn’t take too long. Notwithstanding a few minor bugs I am now overly attached to this website. Let me know what you think though – if you have any suggestions for improvements let me know! I’ve been drawing this on and off over the past week or so, experimenting with different textures and colour combos. I really wanted to draw something grungy and heavily textured, so I think I succeeded in this aspect…..grunge is just so much fun to experiment with. I was actually inspired by a cigarette ad, funnily enough. I decided to expand on the idea of having crayons instead of cigs in the box… with an interpretation of my own creative process. So yes, this is art about ART! I’m actually pretty happy with how this turned out. I could probably do the texture on the pants better but I’m still learning techniques to do that. It’s difficult. And I made the most out of the digital medium with this, as you can probably tell. I did want to include some aspect of traditional media in there too though, so hopefully I got that across with the ‘hand-drawn’ sketches. I kept some element of design in it too, with the composition and the transition from the grunge to the white and abstract coloured ‘building blocks’. It all turned out a lot better than I expected overall, although I am still working on perspective and anatomy (remember how I said I’d be drawing things I’m bad at at the start of the year?) Perspective seems really simple but it really does my head in sometimes. We practised a lot of perspective last semester but I think it’s just something you have to keep working at. Setting up a drawing with lines isn’t my idea of fun….you know when you just want to get straight into something? I guess it feels overly technical a lot of the time. But then again, there’s a reason why art with proper perspective looks so good. Something I also want to work more on in my digital paintings is a sort of ‘humanist’ aspect. It’s not something I really realised or thought about before, but I think humanistic illustrations are appealing because they’re personal. By humanist I mean art that has hand-rendered quirks…or digital art with really expressive brush strokes and lines. My style with digital art is pretty sleek to the point where I probably blend and soften things a bit too much…it’s hard to make digital art stand out by itself as a lot of the time it’s perfectly rendered and very ‘clean’. But hopefully I’ll keep working on that as I develop my own style further. So on to other things…I really want to rant about how amazing WordPress is. It just keeps getting better and better; I can’t believe how amazing it is and that it’s FREE (for everyday people anyway!) It’s such a powerful, well designed CMS, and those that argue WordPress is just a blogging tool are simply missing out. Ok it has it’s faults and the media uploader has only just met passable stage…but for the most part it’s all good. I only just started using widgets actually, and I can see why most people use them now lol…I mean seriously, where have I been the last few years. I feel like I’ve stepped out into the modern era, haha. One thing I discovered recently is Jetpack, a plugin made by WordPress. Yes I know…I am way behind the times. But seriously, this plugin should ship with every WordPress install. It adds so much functionality you’d kinda expect on websites nowadays, like the Publicize plugin which is one of my favourite features. It’s a module on Jetpack that lets you connect all your social media sites in one place, and spam them whenever you update your site. GENIUS. You can also modify which site to spam in each post, which is of course pretty handy. Ooh another thing that’s really cool in this theme (going a bit off topic here) is the different post types (check out the screenshot). It kinda makes the blog like Tumblr I suppose but all in one place. SO COOL. It looks annoying at first, but trust me, it’s really intuitive and just really well designed. You can add, delete, even clone columns, and when you click on the pen you can edit the content with the regular WordPress editor. It’s really neat and would be really useful for business websites I think. 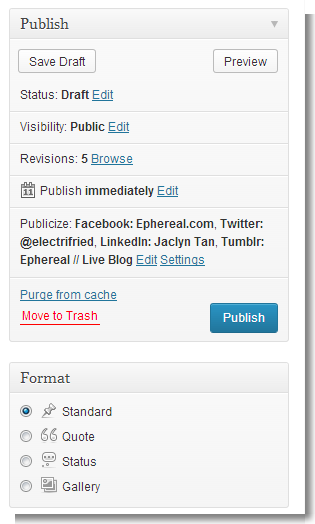 I’m pretty tempted to get the pro plugin though; the free one only lets you use it on pages and not posts. I dunno. What do you think? Do you think it’d be better reading blogs in a 2 or 3 column layout? Let me know! I’m in the process of updating my gallery and pretty much every other page on this site at the moment. It’s taking a while, especially since I’ve got so much randomness everywhere on this site. I’ll get mostly everything updated soon though, i hope. I just finished updating my shop, so go check it out. On to other art news, I’ve started experimenting with gouache lately. It’s like a thicker watercolour and dries flat, but I’m finding it so much easier to control, plus I also really like how it looks when it’s dry. It is hard to mix colours though, and when it dries it tends to change values a bit which makes it challenging since I have just the basic colours. Jacksons has a sale on gouache at the moment so I thought I may as well buy a few, since I had to get some white gouache anyway for a typography project (which I handed in today – a week early! YES I am one of those peoples who like to be on top of every assignment, deal with it ). For the typo assignment, we had to trace and colour four typefaces; Times New Roman, Gill Sans, Garamond and Helvetica. 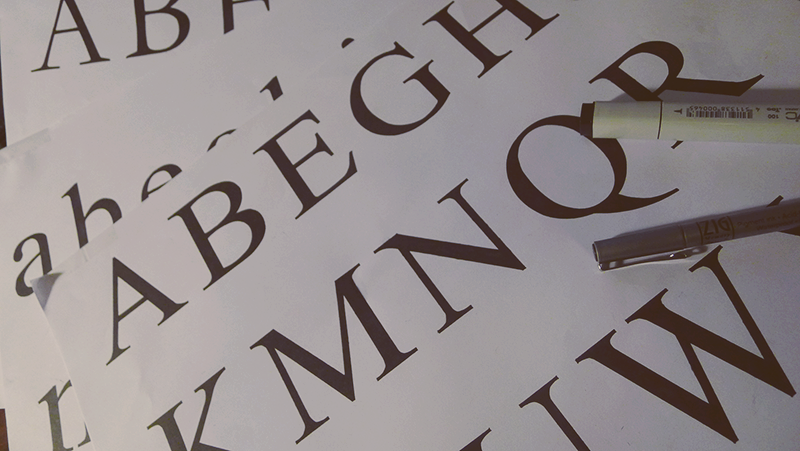 I won’t lie, it was torturous and I wanted to cry every time I made a mistake….but it DID teach me how much effort and detail goes into fonts. I can’t believe people used to hand render type…boggles the mind really. The fact that some of those typefaces are ones we still use today just shows how quality they are. Anyway, I’m really enjoying the units I’m doing this semester, they’re all really fun and I’m learning a lot. I’m doing a synectic drawing (bringing different things together) for a critical thinking unit, and I want to use mixed media to bring it to life (we can do whatever we want for this one which is awesome). I’ll probably post an image of it when I’m done. I don’t know yet if I’ll do one A4 piece or two A5 pieces though; I have a few ideas my teacher thought were pretty good so I may do more. Plus I want to do most of it in watercolour and gouache which will be interesting…mainly because of my inexperience and the sheer COST of traditional media in general. He could probably tell I was a student though because he redirected me to the el cheapo basic ones. He said it’s because the more expensive ones are harder to mix, which makes sense, but yeah….still. Laawwwll I just had to giggle when I took a photo of that middle one. I mean really. The paper’s not even glued to the top properly so it shreds but it’s thick so it takes big chunks off….so bad. And when you actually use the paper for watercolour (which is the intended purpose from what it says on the cover), the paper starts to disintegrate and go pulpy after the second wash. And the texture reminds me of paper towels. Rofl. So, so bad. At least it makes good test paper but I guess you can’t expect much for $3. I have cheapo sketchbooks though (I’m talking the $3 spiral bound ones) and they’ve been fine for me so far…then again most of my sketches are really scribbles and inane randomness though. It’s kinda funny because I have a book full of sketchbook pics from various artists, and all theirs are really detailed and rendered nicely…and mine’s just kinda….meh. OH well I guess it’s the concept that’s the most valuable thing right? Anyway I’d better get some sleeeeep….TGIF! Previous: How awesome is this new theme! ?